Asphalt sealcoating can extend the life of your driveway, road, or parking lot up to 300%? That’s right, whether you have a residential or commercial property, sealcoating is essential to protecting your pavement and reducing maintenance costs. Asphalt sealcoating is the process of sealing the asphalt surface to provide a protective barrier from the elements and wear. The term “sealcoating” refers to the process of adding protective properties to the asphalt and then sealing it to promote longevity. Sealcoating is an ideal pairing for new asphalt or recently laid asphalt. Unfortunately, however, sealcoating alone will not compensate for pavement defects. It’s intended as a protective coat; not as crack filler or leveling material. If you think that your asphalt is in need of more extensive work, contact us about crack filling, patching or asphalt repair services! Sealcoating is important for a number of reasons and it’s important to make it a regular part of your maintenance routine. Here are a few in-depth reasons why we recommend sealing your asphalt regularly. ● Sealcoating protects your asphalt from the elements. The sun, water, and inclement weather can all have damaging effects on your asphalt. Sure, it looks tough, but when unsealed pavement is exposed to the elements it can harden. Hard pavement becomes brittle and cracks when exposed to traffic and weather changes. This leaves you with a beaten and broken surface. Sealcoating combats this situation by providing a waterproof and weatherproof top coat, as well as a more driveable surface overall. ● Sealcoating increases surface friction. Cars and trucks are going to drive on your asphalt — that’s a given — and traffic will wear down asphalt over time. When enough of the material is worn off, the driveable surface becomes too smooth and polished, creating a slippery roadway. Sealcoating gives the pavement more texture and increases the surface friction. This allows your road, parking lot or driveway to be functional for much longer. At Asphalt Advanced Services we work hard to make sure our sealcoating process is done right every time. We seal with a strong lacquer and add sand to our sealcoating mixture to make it more durable. We use commercial-grade Coal-Tar Emulsion Sealer on all of our projects, so our customers can count on maximum durability. Need asphalt services? Our team is dedicated to providing excellent customer service and above and beyond results. 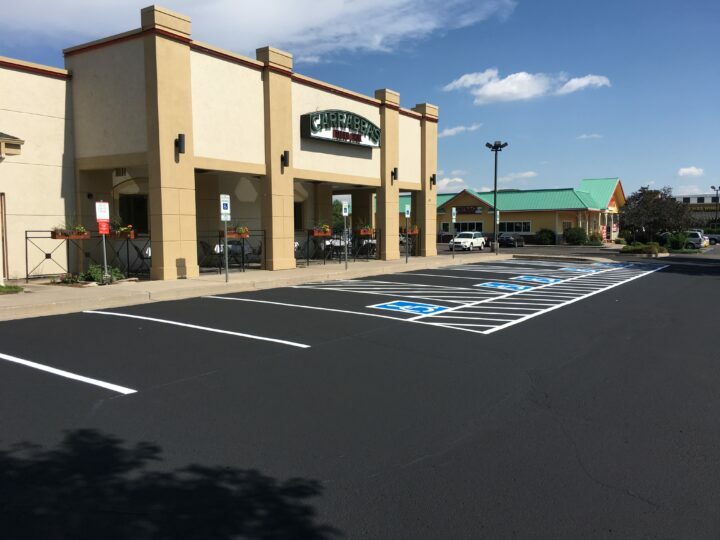 Our affordable pricing and quick turnaround time is why Colorado Springs residents and businesses choose us for all of their asphalt work.